The B-1B is a multi-role, long-range bomber, capable of flying intercontinental missions without refueling, then penetrating present and predicted sophisticated enemy defenses. It can perform a variety of missions, including that of a conventional weapons carrier for theater operations. Through 1991, the B-1 was dedicated to the nuclear deterrence role as part of the single integrated operational plan (SIOP). Converting the B-1B to the conventional role was a gradual process, beginning in 1993 and culminating in October 1997 when the 7th Bomb Wing at Dyess AFB flew the last nuclear mission. As the B-1A Program was terminated in 1977, the DOD initiated a study through the Air Force Scientific Advisory Board to determine the need and direction for future strategic bombers. The results of the study concluded that a derivative of the B-1A, the B-1B, was the best candidate to fulfill the nation's needs within the envisioned mission requirements and the projected deployment date. Although the B-1B retained the same general geometrical shape of the B-1A, the shift in emphasis on penetration of highly defended tar-gets resulted in modifications to the more crucial aircraft systems, especially defensive systems. The B-1B has a maximum speed of only half that of the B-1A, but it incorporates many more advanced concepts for enhanced survivability. Then known as the Long Range Combat Aircraft (LRCA), the B-1B was selected as the next strategic bomber and endorsed for production by President Ronald Reagan in October 1981. 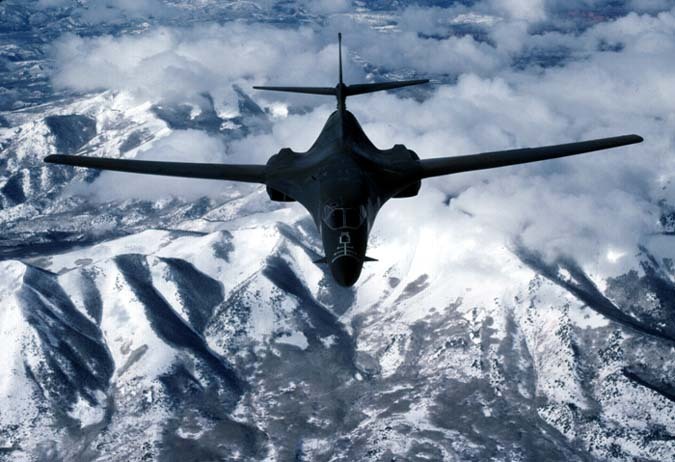 The B-1B's electronic jamming equipment, infrared countermeasures, radar location and warning systems complement its low-radar cross-section and form an integrated defense system for the aircraft. The swing-wing design and turbofan engines not only provide greater range and high speed at low levels but they also enhance the bomber's survivability. Wing sweep at the full-forward position allows a short takeoff roll and a fast base-escape profile for airfields under attack. Once airborne, the wings are positioned for maximum cruise distance or high-speed penetration. The B-1B holds several world records for speed, payload and distance. The National Aeronautic Association recognized the B-1B for completing one of the 10 most memorable record flights for 1994. The B-1B uses radar and inertial navigation equipment enabling aircrews to globally navigate, update mission profiles and target coordinates in-flight, and precision bomb without the need for ground based navigation aids. Included in the B-1B offensive avionics are modular electronics that allow maintenance personnel to precisely identify technical difficulties and replace avionics components in a fast, efficient manner on the ground. The aircraft's AN/ALQ 161A defensive avionics is a comprehensive electronic counter-measures package that detects and counters enemy radar threats. It also has the capability to detect and counter missiles attacking from the rear. It defends the aircraft by applying the appropriate counter-measures, such as electronic jamming or dispensing expendable chaff and flares. Similar to the offensive avionics, the defensive suite has a re-programmable design that allows in-flight changes to be made to counter new or changing threats. Low radar cross-section to make detection considerably more difficult. Ability to fly lower and faster while carrying a larger payload. Advanced electronic countermeasures to enhance survivability. Many of the risks and problems encountered in this procurement trace their roots back to initial decisions made by high levels in the administration and Congress in political negotiations to allow the building of the aircraft. Three constraints were imposed: initial operational capability by 1987, a budget ceiling of $20.5 billion, and the government to act as an integrator of the four major contractors. These conditions were not conducive to the development of the very technically advanced craft. The result was that the bomber had not lived up to the full potential originally envisioned.